« Is This What They Label As “Fake News”? French Second Level Students Visiting Tipperary. 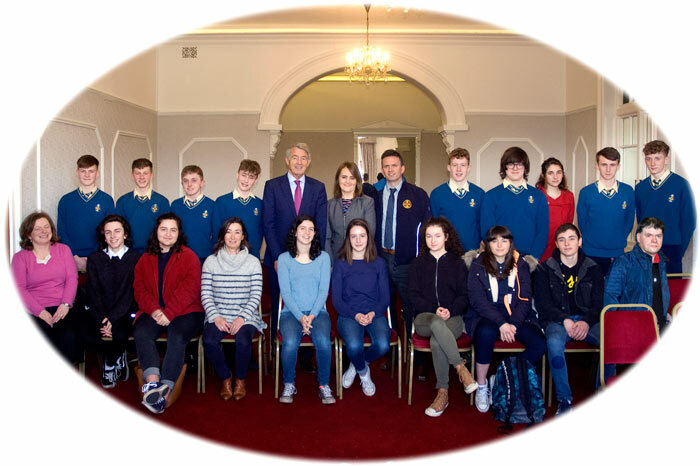 A number of French Transition Year and 5th year students; part of a student exchange programme undertaken by Scoil na mBraithre Chriostai (C.B.S) secondary school, and Coláiste Phobal Ros Cré, are presently visiting the towns of Thurles and Roscrea this week. Here in Thurles, on Monday morning last the group were the guests of Hayes Hotel, who kindly invited them to partake of mid-morning tea and scones, together with a one-hour history lecture on Ireland’s Great Famine (1845-1850). The group is being led by French and English-speaking teachers; Mary Kennedy, Pauline Deegan, Anne Marie Mullins, Isabelle Herlet and Sylvie Lissillour. The all fluent English-speaking students, were formally welcomed to Thurles town by Independent T.D. Mr Michael Lowry, Ms Philomena Cunlu (Asst. Man. Hayes Hotel) and Mr Tiernan O’Donnell (Principal Thurles C.B.S.). The students were surprised to learn that during the Great Famine period in Ireland’s history, while England may have ruled Ireland; Thurles and its lands were owned by a French diplomat of aristocratic descent. The once owner of Thurles Town, Francis James Mathew, 2nd and last Earl of Llandaff, had been a spendthrift. To pay his enormous racing and gambling debts, he had sold all the family estates in Wales and some of his Irish estates; while heavily mortgaging the remainder including Thurles. He died suddenly, intestate, in Dublin on 12th March 1833, leaving no issue. His divided estate lands here in Tipperary then passed to his sister, Lady Elisha (Elizabeth) Mathew, born in 1781, and who herself died unmarried at her house in Molesworth St., Dublin, on 14th December 1841. Following her death, Lady Elisha Mathew, in her legal right, and through her Will, bequeathed the Mathew, Earl of Llandaff (Welsh: Eglwys Gadeiriol Llandaf,) estates, including Thurles, Co. Tipperary (latter 1,713 acres), to her cousin the Comte de Jarnac, Viscount Chabot, (1815-1875), of the house of Rohan, France. Thomas F. Meagher – Irish Flag. The student group also learned, possibly for the first time, that Thomas Francis Meagher and William Smith O’Brien leaders of the failed Irish Nationalist uprising at Ballingarry (SR) Co. Tipperary, (Also known as the Battle of Widow McCormack’s Cabbage Patch), in 1848; having visited France to study revolutionary events there, had returned to Ireland with the new ‘Flag of Ireland’, a tricolour of Green, White and Orange made by, and presented to both men by French women sympathetic to the Irish cause. Today, Article 7 of Bunreacht na hÉireann, Constitution of Ireland, confirms; ‘The national flag is the Tricolour of green, white and orange’.